Twenty years ago, I accomplished something I never expected to do. I finished my first Ironman triathlon. Finishing an Ironman — a race that includes a 2.4-mile swim, followed by a 112-mile bike ride and a full (26.2-mile) marathon — was unlikely for me because I’ve never been a “natural” athlete. 1. Effort is more important than talent. I never had a talent for sports. In fact, I was that stereotypical “fat kid.” I topped 250 pounds before even reaching high school, and one of my worst adolescent memories was being berated by a ninth-grade soccer coach as I agonized through just a one-mile run. I lost most of the weight in college, and I discovered that I actually loved running. But, I still wasn’t a natural athlete. Even after deciding to try an Ironman and putting in a full year of training, I still weighed 200 pounds by race day. That’s lean for me, but at least 40 pounds more than most other competitors. I felt like a Rottweiler toeing the start line in a sport designed for whippets. But an Ironman is hard — really, really hard — no matter what your build. Getting to the finish line is about much more than just natural talent. It’s about how hard you’re willing to push. I was used to pushing myself really hard. I’d been doing it ever since those ill-fated ninth-grade soccer days, and that made a big difference. I was surprised to find myself passing a lot of “whippets” the last miles of the race. In the business world, we frequently over-glorify the idea of natural talent. It’s that tendency to celebrate the smartest guy or gal in the room. We overlook the fact that, for most significant accomplishments, it’s the hard work and persistence that ultimately bring success. Natural talent is great, but in business, it’s like a 10% headstart. The other 90% is about the effort you’re willing to put in. Great leaders create work cultures that foster the hard work and persistence rather than over-glorifying natural talent. 2. It’s about keeping your head in the moment. Finishing an Ironman takes a long time. The current world record is just under 8 hours, but the average athlete takes between 12 and 14 hours to finish. Some people take as long as 17 hours. When you push your body that hard for 8, 12 or 17 hours, something is bound to go wrong. You might lose your goggles in the swim, get a flat tire on the bike or get a cramp during the run. In one race, I remember getting nauseous because something in the Gatorade they served didn’t agree with my stomach. When you’re under that amount of physical stress and something goes wrong, it’s easy to become overwhelmed mentally. But getting overwhelmed carries a huge price. It burns critical energy you need later, and it prevents you from putting in your best effort. Remaining calm and keeping your head in the moment can be the difference between finishing or not. Business leaders face enormous stress too. Unforeseen issues and human error can take their toll, and a lot of leaders can become overwhelmed. They get overly emotional and lash out at their teams. But losing your head in a moment of high stress carries a heavy price in business too. It can cause your people to lose confidence and damage important relationships. Most importantly, losing your head at a time of stress robs you of the possibility to bring your best self to the challenge. Excellent leaders are good at managing stress. They keep their heads up during those tough times and they encourage their people to do the same. 3. Look for the lessons in unexpected places. That first Ironman 20 years ago had another surprise, and I loved it! 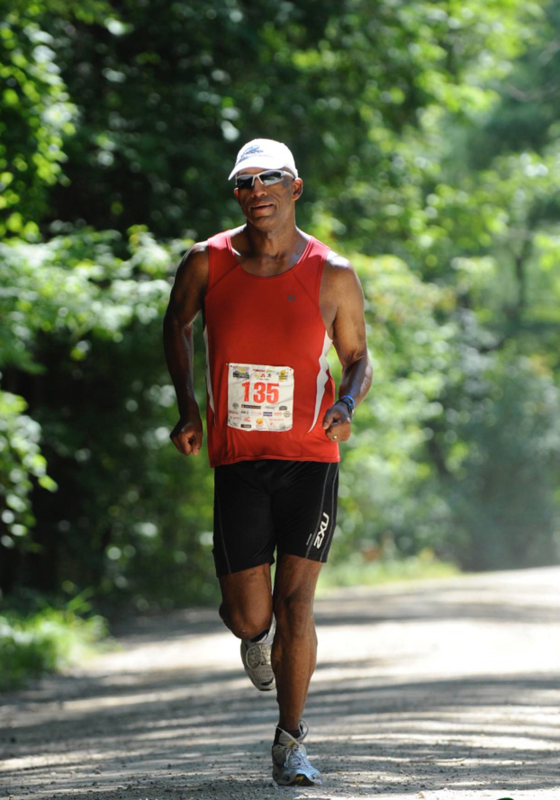 Over the next decade of my life, I completed a total of seven more Ironman races. At the same time, my corporate career was taking root, and I was learning a lot. I already had my MBA, and I got some amazing assignments. The companies I worked with also provided some spectacular leadership training. But I was getting more leadership lessons in a very unexpected place — while I was out training and racing — and they were often lessons I could take right back to the office. Lessons like: no matter how tough things get, I could always make it a little further; and sometimes, you need to slow down a little bit in order to reach the end goal. Perhaps most of all, I learned to be open to leadership lessons from unexpected places. Great leaders are the same. They see the lessons in things that don’t even seem related to business, like the way Steve Jobs credited taking calligraphy with giving the aesthetic sensibility he needed to design beautiful products. Or, it might be creating a company culture where everyone has the ability to communicate with anyone and where it’s safe for anyone to offer an idea, like Ed Catmull has done (subscription required) at Disney and Pixar Animation Studios. Great leadership is often about going beyond the ordinary in search of the lessons you need.